Home CDAC Recruitment Engineer Jobs Jobs Jobs In Mumbai Technician Jobs C-DAC Recruitment 2019|Apply Online For 91 Project Engineers And Project Managers On Contractual Basis. C-DAC Recruitment 2019|Apply Online For 91 Project Engineers And Project Managers On Contractual Basis. 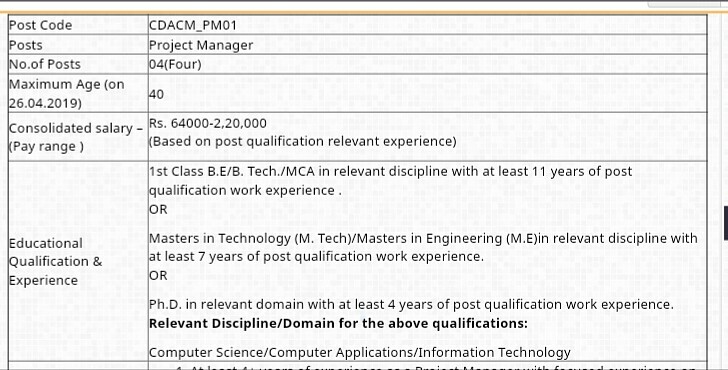 Centre for Development of Advanced Computing, Mumbai, Is Appointing Eligible People To The Posts Which We'll Mention Below. So Interested People Can Apply For This Job Through Online Mode, Within The Given Time Period. Kindly Do Check Out The Official Advertisement For An Accurate Information And Instructions, Which Is Given Down Below. Project Engineers/Managers →91 Vacancies, Kindly Do Check Out The Images Below For Name Of The Posts, Age Limit, Educational Qualifications & Codes. B. Eligible Criteria For Project Engineers & Project Managers Job Vacancy In C-DAC Recruitment 2019. Age Limit →Check Out The Above Image's. Mode Of Examination/Selection Process →C-DAC Selection Rules Applies. For More Info →The Official Website Of C-DAC. Now Apply For CDAC Recruitment 2019 Apply Online For Project Engineers/Managers Post.